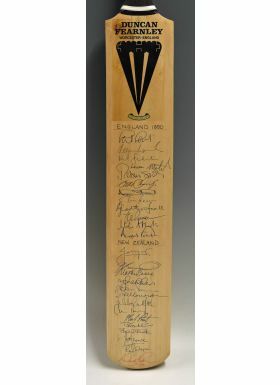 1990 England and New Zealand Signed Cricket Bat a Duncan Fearnley bat, signed to front with England and New Zealand team signatures, with Warwickshire County Cricket Club label to the rear. Rubber grip perished. From the personal collection of Bernard Thomas, who was the physiotherapist for the England team between 1970 and 1985.